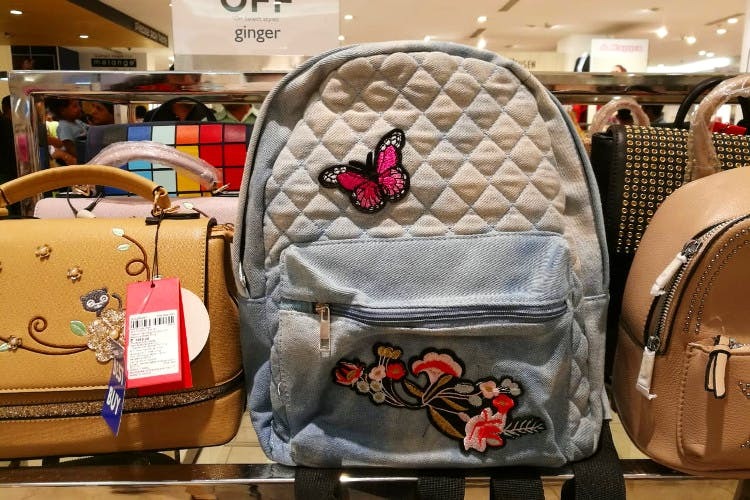 Shopping At Inorbit Mall With INR 5,000: We Tried But Did We Conquer? Ladies, do you want to indulge in shopping but don’t want to go around splurging all your bucks? Then we got just the thing for you. We went scouting (erm…shopping) for stuff under INR 5,000 at Inorbit Mall, and went ‘ooh’, ‘aah’, and even ‘ugh’ at the latest collection. While a lot of things grabbed our eyes, we stuck to our plan and bought stuff under INR 5,000 only. So, let’s get straight to it, shall we? We spotted the cutest summer wear at Max. Ranging from shorts to skater dresses to flip-flops, Max is killing it this season. We are loving their collection of cami tops too. But we got our eyes on this white cami top with black strap and floral embroidery — pair this with denim shorts, and you’re beach ready. We also grabbed a skater dress with a criss-cross racerback — bright orange with pineapple print, this one’s our current crush. On walking into Lifestyle, the first thing that caught our eyes was a distressed denim backpack by Ginger. With butterflies and floral work on it, this one’s a classic and a must-have. Plus, it’s functional too! It has a front zip for you to pack up all your cards, gloss, and sunnies. The main zip, although only one, can carry your water bottle (or coffee flask if you are like us), notebooks, and plenty of other knick-knacks that you’ll need. Also, this one’s a perfect company if you are going out shopping and want to stuff in your loot! We discovered a kiosk on the third floor of the mall that’s well-stocked with handmade soaps, ubtans, oils etc. We couldn’t get enough of the aroma wafting from the products and got ourselves a handmade soap — lavender & oatmeal that is also enriched with shea butter and manjistha (a plant that is said to heal acne). On the same floor as Ancient Living, we also spotted Rushers — a footwear stall. Right from flip-flops to moccasins to pom pom shoes, there’s plenty to pick from. Plus, all of them are budget. We loved this pair of soft sole mules. Done in pink with butterflies and flowers splashed all over them, you can keep it casual with this pair. Crossword inside Shopper’s Stop abounds with printed t-shirts and slogan t-shirts, and we couldn’t get enough of the Pokemon themed ones. We also love the t-shirts by WYO (Wear Your Opinion) and got ourselves a bright red oversized t-shirt. Plus, it’s a unisex t-shirt, so if your bae loves to read, this one’s a perfect gift. By the end of our shopping excursion, we were a little sad on not finding any accessories. But Global Desi wiped those woes out. We found the perfect pair of earrings to go with indo-western outfits and kurtas. We heart this one for its bright colours that complement the golden star mesh hanging. So, we spent INR 4,854 and were left with INR 146. We decided to treat ourselves with a Double Chocolate Cookie Chunk from Cookie Man and got two with each priced at INR 70. Sorted!